In addition to reading books, I love listening to music. I find that both activities make me happy and I can thus never pass up on seeing the two of them together. A fluffy romance book all about music that is full of diversity? Please count me in! Just like I anticipated, I loved Tone Deaf! Although at times it got more serious, it was happy and lighthearted enough to transmit those positive vibes to me. I am exuberant to read more from the amazing Olivia Rivers! To synopsize, this story revolves around two teens named Ali and Jace. Because of a brain tumour, Ali has gone deaf, and this stops her from being passionate about music. 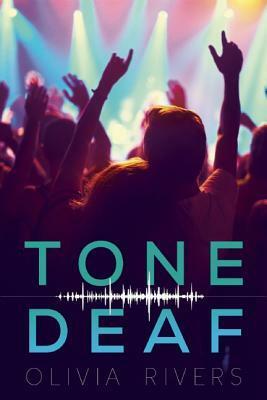 She ends up winning a backstage pass to see a popular band called Tone Deaf, which Jace is a part of. Admittedly, his reputation isn’t the most positive, and Ali is turned off by him from the start. But Jace understands where she’s coming from, and so he decides to take her with him during the rest of the band’s tour. Will Ali warm up to Jace and learn to love music again? The two protagonists of this story were very pleasant to read about, and they made the novel the gem that it honestly is. Ali was such a sweetheart! I felt so bad for her regarding all the obstacles that she’d had to go through at only 17 years old, but in retrospect, she was actually extremely lucky. How many average joe people get to meet and form relationships with celebrities? Not many, and even though at first she was notably reluctant to meet Jace, I loved how the two meshed. Speaking of Jace, he was super cool and hip and I just loved him, even in spite of all the controversy that there was regarding him in the novel. I also feel like raving about this book’s premise and plot- both were amazingly crafted! I could hardly put this book down while reading; I was literally so mesmerized. The premise itself was also very unique and unlike that of most books in the world, and I really, really appreciated that. If I were to compare Tone Deaf to one other book, then it would be Open Road Summer by Emery Lord. Both books are full of awesome music, friendship, cute romance, and great characters, so if you liked one of the two, you’ll for sure devour the other. To sum it all up, I loved pretty much everything about this book, and I can almost guarantee that anyone who gives it a try will have a lot of fun with it! OOOOHHH this book looks super interesting and really sweet yet crazy and adventurous!! I’ll have to add it to my TBR– great review! !